Cubed shaped UFO. Is it real, or a hoax??? 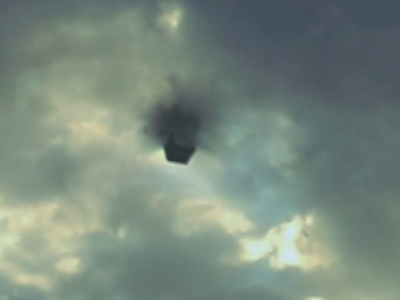 On June 29, 2015, several witnesses snapped photos of what appears to be a cubed shaped UFO. Let me say at the start, I do not know if this is a hoax, a picture that has been tampered with using Photoshop, or an example of authentic UFO activity. It does appear that the object seems to materialize out of a black vortex formed among the clouds. It is a compelling picture to say the least, and apparently it was confirmed by a second witness also in El Paso Texas. If this is an authentic manifestation of a UFO then it is a good example of something from the spiritual dimension bleeding through into our dimension of time and space. I have seen the orb type manifestation appear on several occasions myself, so I do know that real manifestations like this are possible. Again, I must stress that I do not know whether this photo is authentic or a good example of a Photoshop hoax until further analysis of the photo can be done, and further examination of both witnesses testimony. The Bible reveals that Earth is ground zero in a Great War involving the Fallen Sons of God and the unfallen Host of Heaven. I do not know how many beings inhabit other dimensions of course, but the Bible seems to reveal whatever the total number of beings are, at least one-third of them defected with the Fallen Cherub, Heylel ben Shachar, Lucifer the Light-Bearer, Son of the Morning. Isaiah 14:12: How art thou fallen from heaven, O Lucifer, son of the morning! how art thou cut down to the ground, which didst weaken the nations! John revealed that when Lucifer fell at least 1/3rd of the Host of Heaven decided to abandon God; once this happened they became sinful and full of darkness, and that is why we have evil in the first place. At the End of Days this fallen host will be cast from the heavens to the Earth just like one would shake off something disgusting from the hand. Revelation 12:3-4a; 7-9:And there appeared another wonder in heaven; and behold a great red dragon, having seven heads and ten horns, and seven crowns upon his heads. And his tail drew the third part of the stars of heaven, and did cast them to the earth…And there was war in heaven: Michael and his angels fought against the dragon; and the dragon fought and his angels,And prevailed not; neither was their place found any more in heaven.And the great dragon was cast out, that old serpent, called the Devil, and Satan, which deceiveth the whole world: he was cast out into the earth, and his angels were cast out with him. This is the moment in time when official alien disclosure occurs. Governments may feed us propaganda regarding aliens, they may even use the alien myth for their advantage, but true alien disclosure will not come from President Obama (he can’t tell the truth anyway), or any other government, or scientific official on the planet. True alien disclosure will happen because of the judgment of God. The Fallen Cherub and his denizens of evil dwell in the atmosphere around our planet. 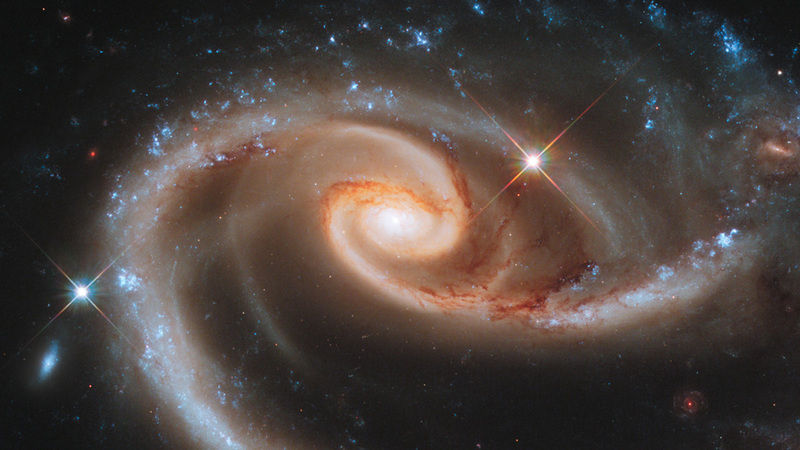 The atmosphere in this case involves the sky above us, and the outer space around our planet. That is why we can see UFOs in NASA footage taken from the International Space Station from time to time. That is also why we see authentic UFO activity in the sky–that is their natural domain, it is their appointed place of habitation. But one day the King of Heaven will have had enough and the Fallen Host will be forcibly cast out of their domain of the air, and will find themselves trapped in our dimension of time and space. When that happens the nations will know the power of judgment, although most people will not recognize it as such. Most of the seven-plus billion inhabitants on the planet will be deceived by this Great Deception. When they see aliens they will be compelled to open their hearts and minds to an evil power unlike anything humanity has been faced with before. These fallen spiritual beings will be embraced by humanity–and it will be a deadly embrace; just as deadly as lifting up a poisonous snake and holding it close to your heart would be. In the end, the bite will prove deadly, and the Old Serpent and his followers will prove that evil comes in many different guises, even the guise of benevolent aliens. After all, don’t many people already refer to them as “Space Brothers?” Even now there are those in positions of power and influence in the Vatican who refer to aliens as Space Brothers. The Great Deception is already working, all we are waiting for are the aliens. Then watch and see as the False Prophet embraces the Serpent just like the Space Brother that he is. You do not have to be deceived by any of this: Christ came to set us free from the power of the Devil. Believe the gospel–Jesus died for our sins, He was buried, and 3 days later he arose from the dead, conquering death, and giving life to all who call upon His name. Call upon the name of Jesus, and by faith He will set you free from sin and give you eternal life. I am also on Facebook! Go there and “like” the page! UFOs and aliens will play a major part in the fulfillment of Bible prophecy. If you would like to learn more about that then I recommend my book Alien Antichrist, The Terrifying Truth about UFOs and Aliens, Antichrist, and the End of Days. Paul said the strong delusion of the last days will be linked with a strange sight in the heavens that is meant to be observed–and he linked this strange sight in the heavens with the Man of Sin, the Antichrist. John revealed that the Fallen Angels will be cast to the Earth, and this will be linked with fire from the heavens–with that said, did you know that angels are called ministers of fire? Are UFOs chariots of God? Or, are the UFO Chariots we see a type of angel? What are the wheels within the wheel that Ezekiel saw, and are they actually UFOs? I address all of this in the book! Get the book and be informed, then when the aliens suddenly appear in the heavens and invade Earth you will know the truth of what is going on and won’t fall for the Great Deception. The Lord said that His people perish for lack of knowledge: be armed, be informed! You can get the book at Amazon and Barnes and Noble. And if you have Kindle Unlimited and Kindle Prime you can download a copy free through that program! Alien Antichrist: The Terrifying Truth about UFOs and Aliens, Antichrist, and the End of Days.